In 1920, almost all U.S. colleges had physical education requirements. By 1970, it was about 70 percent. In 2013, CPHHS kinesiology professor Brad Cardinal and his colleagues published a study that found that number had plummeted to about 40 percent. Oregon State University is included in the 40 percent, requiring undergraduate students to take three fitness credits as part of its Baccalaureate Core curriculum. 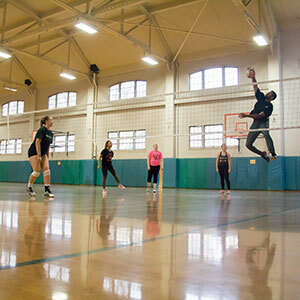 Students take Lifetime Fitness for Health (HHS 231) for two credits and choose from a variety of Physical Activity Courses (PAC) for one credit. There are nearly 250 PAC courses offered this fall, and about 18,000 students take a PAC class each year. With such a wide variety of classes to choose from – activities as diverse as bowling, surfing, billiards and fly fishing – there’s something for everyone. “We have such a wide range of classes, it’s almost hard to list them all,” says PAC director Drew Ibarra. Drew says that he believes that OSU’s physical education requirement helps students’ physical and mental well-being. “There are numerous studies pointing to the benefits of physical activity, including making good grades, reducing anxiety and depression, and developing character and identity,” he says. In Lifetime Fitness for Health, students cover four main topic areas – physical activity promotion, nutrition education, health behavior change and mental well-being. CPHHS clinical assistant professor Erica Woekel says that while these topics are covered in-depth, students also learn strategies to implement the knowledge. Developing these skills helps them put these important topics into practice. Brad, who’s never missed a day of exercise since Oct. 1, 2009, says that students can continue their fitness habits after their college years with the proper mindset and simple routines. For example, those who work a desk job may find it challenging to incorporate physical activity into their daily routine. “Desk workers can try many different things,” Brad says. “Some set reminders to move about for three to five minutes every hour. Some are trying standing desks, standing on unstable surfaces, siting on physioballs instead of traditional chairs and even walking workstations. Drew says that another major component of developing lifelong fitness habits is finding activities you enjoy. When you boil it down, moving is the key component to any type of physical activity, and enjoyment makes it something you want to do, not have to do. “My default is to choose to move,” Brad says. “I take pride in simple habits, such as taking the stairs instead of the elevator or escalator. My behavior might even influence others through the process of role modeling.